Whatever time you wake up in the morning, there are solid reasons for “morning weighting” your day, and for having a consistent morning ritual. In this episode, I pull back the kimono to share my own morning ritual. If you are a stay-up-late person, never fear — this is not about waking up insanely early, but rather about putting your important work early in your day, whatever time you get up. When you do your important work early in your day, you get it done before your willpower reserves have been drained and “decision fatigue” has had a chance to set in. 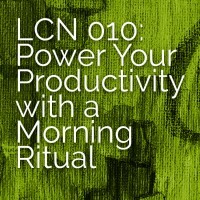 Tip: Prep your morning actions the night before! For example, before I go to bed at night, I fill the tea kettle and put tea bag packages on the counter. Also, please leave an honest review for Live Creative Now on Tunes! Ratings and reviews make a big difference in how the show is ranked, and that makes a big difference in helping other people find it, and that helps grow the Creative Uprising! So you can be an important part of this movement simply by leaving a review.